Beauty: Oriflame Consultant Opportunity Details - Benefits, Rewards, Incentives! Oriflame Consultant Opportunity Details - Benefits, Rewards, Incentives! Oriflame is a great opportunity. You can buy products for yourself and your friends. You can make some extra money 5-10,000. Or you can make a career as a Manager or Director in Oriflame and earn 50,000 - 1,00,000+. Joining Oriflame is easy. Pay your joining is free and fill the Consultant Application form and once we submit your form you will get your Consultant Id and password will be sent to your email id. You will also receive your joining kit thru us or by courier depending on your choice. Join with someone who knows how Oriflame works. Someone who is successful and someone who is interested in your success. After joining you will need to get some 10-20 catalogues depending on how big your friend circle is so that you can hand it over to them. Your friends and their family members can go thru the catalogue and let you know the products they need this month. Then if you want to make a career out of Oriflame, you can learn prospecting and start recruiting people in your team. You can also conduct home demonstrations and participate in Oriflame Opportunity meetings to get more joinings and more customers. The gift changes every month but there is a gift for all qualifiers. Complete 75 BP within 30 days of joining and get a FREE gift! Complete 100 BP in the next calendar month and get your 2nd FREE gift! Complete 125 BP in the next calendar month and get the 3rd FREE gift! Complete 150 BP in the next calendar month and get any 1 product worth 1000+ of your choice at 50% off!!! Every month as a consultant you can get 1 high value product at 40-50% off by doing 150 points. This offer is valid as long as you are a consultant. Mrs. Jashmi is an Oriflame Manager. She is also an Oriflame Certified Beauty Expert. In April she received an award for her performance at an Oriflame event in Mumbai. Her team is spread all across India and many people have got success by following her tips and guidance. Mrs. Jashmi is an Oriflame Director . She is also an Oriflame Certified Beauty Expert. In April she received an award for her performance at an Oriflame event in Mumbai. Click here to Find Oriflame Dealers in Mumbai, Delhi, and Other Cities. Click here to Buy Oriflame Products from Authorized Oriflame Consultants. 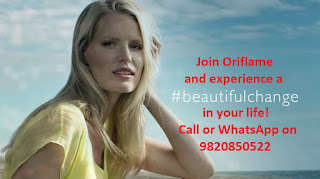 Click here if you want the latest Oriflame Catalogue-India from an authorized Oriflame Consultants from your city. If you have any other questions just leave your comments and we will reply to your comments. Nothing is compulsory. You can place orders less that 1250 by paying Rs 35 extra. But if you are a consultant and you are circulating catalogues you will always have lots of customers to serve and lots of orders to bother about the 1250 mark. what are the benifits if we complete 150BP within the first 30 days of joining? if i'm not order 2 or 3 months u'll break my consultant? if i'm not order product 2 or 3 months my consultant is rejected ? Not really but you are counted as inactive. 400 Bp cross karne k baad me muje comission k alava vo koi b ek product 50 % ofc me milegi.aur kuch milta he kya??? Yes when you do 150 points you will get business class benefit. What ever it is in that month. Congratulation! You are a 15% Manager! You get a cheque income and you can come for the next Manager seminar. You can come for special training programs announced by your branch / upline leader and grow further. Maine sep 2016 me join kiya hai to kya me abhi kisiko recruit kar sakati hu? ?.aur uasaka muze kya benifit hoga??? hi I'm 3% oriflame consultant. Is it really necessary for me to put up an order of 100 BP in my id each month.....My oriflame team leader tells that it is compulsory for me to put 100 points order otherwise my recruits will go under her....Is it so? I have joined oriflame as a consultant week ago. This is my level 1 can i recruit a consultant to complete my level 1,and how many consultants one can recruit under them. Points which we score in the frst month will be counted evry month? Joining ke baad 1 month me 100 bp complete karna compulsory Hai Kya..? Joining ke baad 100 bp complete karna compulsory Hai Kya..?